FILE PHOTO: A screen shows the logo and a ticker symbol for The Walt Disney Company on the floor of the New York Stock Exchange in New York, Dec. 14, 2017. 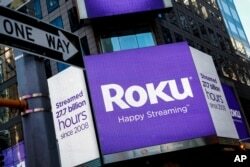 FILE PHOTO A video sign displays the logo for Roku Inc, a Fox-backed video streaming firm, in Times Square after the company's IPO at the Nasdaq Market in New York, U.S., Sept. 28, 2017. 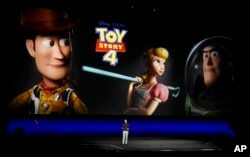 Producer Jonas Rivera of Pixar Animation Studios discusses the upcoming film "Toy Story 4" during the Walt Disney Studios Motion Pictures presentation at CinemaCon, April 3, 2019, in Las Vegas. The Mouse House, as Disney is known, will join the market at a time when audiences are facing a host of choices, and monthly bills, for digital entertainment. Apple Inc, AT&T Inc's WarnerMedia and others plan new streaming services. To bolster its potential digital portfolio, Disney recently purchased film and TV assets from Rupert Murdoch's 21st Century Fox and gained prized properties such as "Avatar."